Chefs Note: Every knife has a specific use and you should use the proper knife for every cutting task. To get the best use out of your knives you need to keep them very sharp, handle your knives properly and practice. A sharp knife is much safer than a dull knife. Selecting good quality knives is very important, a knife should fit your hand, be quite comfortable and should only be used for it's intended task. A good Chef Knife in the hands of a skilled cook can be more accurate and faster than a machine. For slicing breads, cakes and pasteries, a bread knife is used most often in the bakeshop and to cut loaves of crusty bread. The blade is usually 8 to 10 inches long. Used for filleting fish. It has a thin flexible blade. The blade is usually 6 or 10 inches long. Used for chopping meats and cutting through bones. It has a heavy rectangular blade. Not to be confused with the Chinese Cleaver (a Chinese Chef Knife) used for most cutting and chopping. Used for For peeling, slicing, trimming and dicing small fruits, vegetables and cheese. The blade is usually 3 to 4 inches long. The blade is 3 to 4 inches long and slightly sharp, it should be used with a butchers glove. The blade is 3 to 4 inches long and blunt, it should be used with a butchers glove. Used for retruing or re aligning the knife edge. It should be used after each cutting task, several strokes on both sides of the blade holiding the knife at a 20 degree angle. Sharpening Steels are 10 to 14 inches long. Diamond Sharpening steels are faster and save time compared to a traditional butchers steel. Chefs Note: These are the most used knives. There are many other kinds of knives. Please email us with more specific questions! The Chef Knife (French Knife) is the cooks most important and versatile cutting tool. A good Chef Knife in the hands of a skilled cook can be more accurate and faster than a machine. Every knife has a specific use and you should use the proper knife for every cutting task. To get the best use out of your knives you need to keep them very sharp, handle your knives properly and practice. A sharp knife is much safer than a dull knife. Knife Materials, understanding the tools. Ever wonder how a great Chef Knife is made? stop wondering and click here to read our Knife Materials section. A Diamond Sharpening Stone is a great tool for sharpening a dull knife and chisels. The best Electric Knife Sharpeners do a great job and save time, we love these, click here! Rotating Sharpening Stones do a great job and are the choice of many chefs and most woodworkers. A Diamond Sharpening Steel (our favorite) or a traditional Butchers Sharpening Steel is used to quickly true the edge of the knife and maintain a sharp edge. It does not sharpen but helps put a fine hone on a sharp blade. Sharpening your knife on a stone or sharpening steel. 1. Most stones are "wetstones" and they require a light coating of oil or water. Both oil and water help cut the steel and keep it cool during sharpening (we prefer to use water on diamond stones or a dry diamond sharpening steel). Japanese knives require using a very fine wetstone or ceramic sharpening steel (1000 grit or finer). These should be used with water maintain a 20 degree angle during sharpening. As the knife becomes sharp, gradually press lightly for a razor edge. 2. If the knife is very dull or damaged start with the rough side of the stone (or a Diamond Sharpening Steel). ?the fine side of the stone (or a Diamond Sharpening Steel). 3. 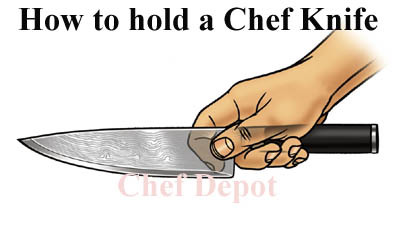 Hold the blade of the knife at a constant 20 degree angle to the stone. 4. Make light even strokes, use the same number of strokes on each side of the blade and sharpen in one direction only. We prefer to cut a slice off the stone. Use the whole blade of the knife from heel to tip. 5. Do not over sharpen your knife. 6. Finish your knife with a dozen strokes on the sharpening steel (or diamond sharpening steel) again a constant 20 degree angle. Make light, even regular strokes on the steel alternating with both sides of the knife and steel . Use the steel often and you will rarely have to use a stone. 7. Test your knife on a piece of paper, it should easily cut ribbons. to keep your knives sharp. Chef shows you how to use sharpening stones. Click Here for the featured Chef Knives! Some of the items used in the kitchen are New Razor Sharp Chef Knives! Notice, the knife is very sharp and cuts very easily. A sharp knife is required by every Chef and gourmet Cook. Chef is using one of his John Boos NSF Maple Cutting Boards! Click the green arrow on the left for sharpeners and the right arrow for more Sharpening Tips! Copyright 1991 - 2016 Chef Depot Inc.